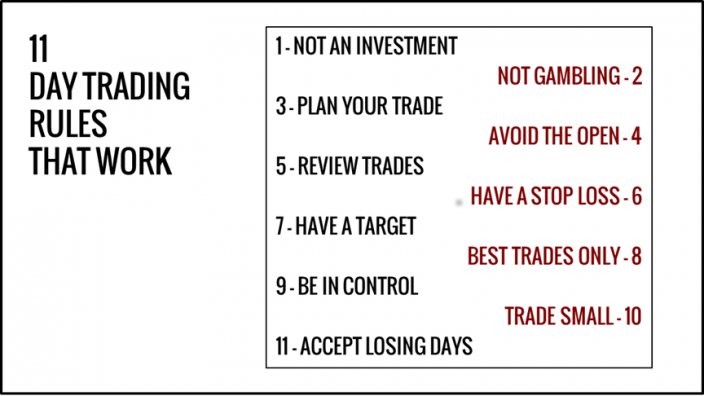 You can have 1001 day trading rules. But you cannot remember them, and will not adhere to them. The result is chaos and a trigger-happy day trader. 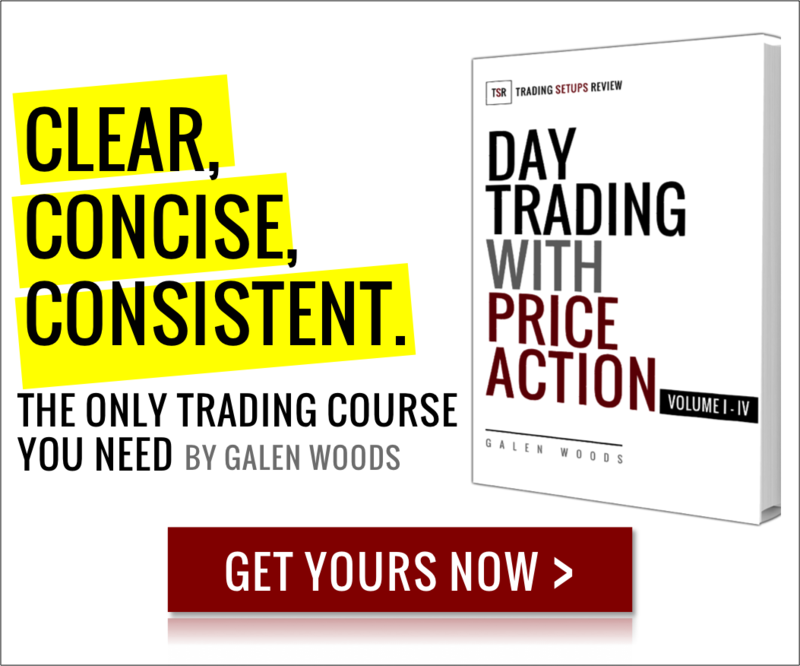 We have distilled 11 day trading rules together with suggestions to help you follow them. 1. Day trading is a not a form of investment. Day trading is not a form of investment. It is not part of the stock/bond portfolio that you have for retirement. Day trading is risky business and you stand to lose everything if you fail. You must accept this fact before you start day trading. On the other hand, day trading is not a form of gambling. If you are not going to take it seriously and put in hard work, do not even start. The first two rules seek to adjust your attitude towards day trading. Once you start with the correct attitude, these “rules” are already with you. And I mean everything. Imagine all the contingencies and plan for them. Plan even for what you are leaving unplanned, which means planning when to use your discretion. The trading plan is a work-in-progress. Keep refining it and add to it. If you have your trading plan in your computer, open it before the trading session each day. If you have it printed out, place it beside your trading computer where you can see it. The first 15 minutes are usually very volatile, without much price action available for analysis. So sit on your hands for the first quarter of the hour and sense the market tone. If you want to consider a trade right after the 15 minutes, take a look at the opening range scalp trading strategy. After each session, there is a learning opportunity. Each trade contributes to a feedback cycle that can improve our trading performance. Each trading session starts with doing nothing and ends with reviewing everything. This is the Alpha and Omega of each trading session. Every trade must have a stop-loss order. We must always know how much we stand to lose. If you disagree, I want you to reconsider. We close our trades before the session ends, so the profit potential is smaller. Hence, we should have our limit orders in place to grab our profits and run. Waiting for the bull run of the century is not for day traders. Use a trading platform that allows you to enter stop-loss orders and target limit orders together with your trade entry. I use Ninjatrader’s Advanced Management Trade feature to save a template for my stop-loss orders and target limit orders. By programming the orders into your trading platform, you will not fail to follow these rules. Be very selective about the trades you take. Taking the best trades is so important that we devoted an article on it. 9. Always be in control of yourself. Do not chase the market. If the market has taken off without you, do not chase it. The market behaves in ways nobody can control. You cannot control the market. Bu you can control your response to the market. Always be in the zone. Lower your trade size when you are in doubt of your trading edge. This is a damage control measure. Ideally, cut your trade size to nothingness until you figure out your trading edge. Somehow, day traders expect to end each day with profits. Trading is a game of probabilities. It is definitely possible to have losing days. Accept them and move on. If you refuse to accept losing days, you will do stupid things like overtrading and ruin your trading account pretty soon. The last three rules are lifesavers. They control damage and avoid risk of ruin. Write them down on a piece of paper and keep it in sight. In fact, just stick it on your computer monitor.